In 1901 when the first electric trolley lumbered around Greenville, it cost a nickel. Here’s something you never hear: it’s even cheaper now! It’s free and runs on a route around the downtown area from Thursday through Sunday year-round. It’s a nice break for sore feet and a great way to see the town! 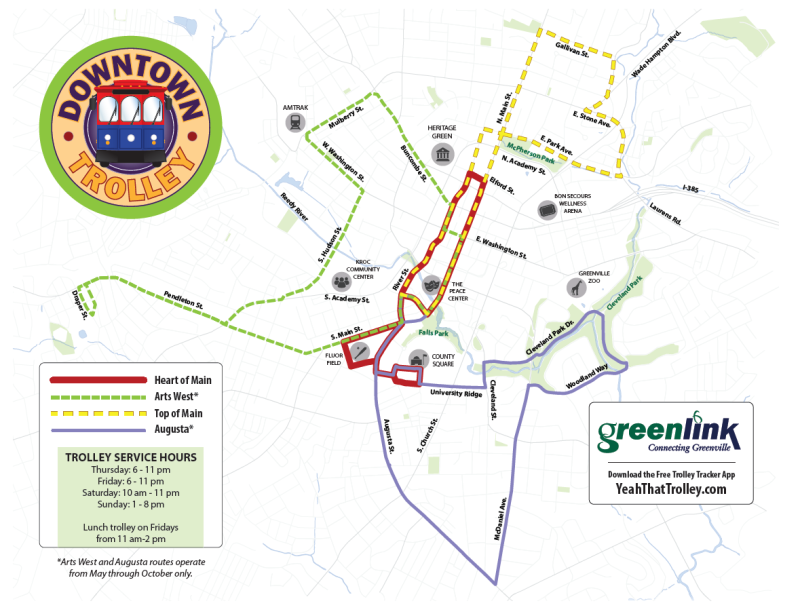 Additionally, during Greenville Drive home games, the trolley shuttles fans from Greenville County Square to the baseball field! Download the app to track the real-time location, see the stops along the trolley route and estimate walking time to get to a trolley stop. From 11 am to 2 pm on Fridays, this lunch route is a continuous loop originating from Greenville County Square and up Main Street.